ChildAges 6-12 yrs. of age. 5 yrs. of age and younger ride free. With nearly 500 years of history, St. Augustine is full of sights and attractions that will entertain and enlighten you. Talented conductors share the history, attractions and sights of St Augustine Florida, Americas oldest city. Experience the best of St Augustine with Old Town Trolley Tour and ride the Trolley for 2 consecutive days. Old Town Trolley Tours now offering a FREE 2nd consecutive day. Sit back and relax as our talented conductors share the history, attractions and sights of St Augustine Florida, Americas oldest city. Featuring 23 stops, including the Fountain of Youth and Fort Castillo de San Marcos. Now enjoy a 2nd Day FREE of touring with Old Town Trolley Tours. All aboard who's coming aboard! You can transfer to Old Town Trolley Tours FREE Beach Bus to: The Alligator Farm, Lighthouse and Museum and St. Augustine beach. See Ponce de Leon's famous spring of eternal hope and sample the water. Relive the days of the conquistadors and discover many colorful facts about Ponce de Leon's arrival in Florida in 1513. You will be walking the grounds of the actual site where Spanish explorers first came ashore in the United States. See Indian hut foundations, relics, burial grounds and much more. Completed in 1891, the jail housed prisoners for over 60 years. It is one of the few surviving 19th century jails. Explore the sheriffs quarters where he and his wife lived adjacent to 72 prisoners. Guests can visit the male and female cells, maximum security area and see a large collection of used weapons. 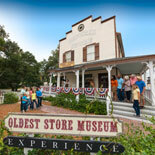 A combination of historical displays and private collections bring over 400 years of Florida history to life. The museum features displays of the various countries that ruled over St. Augustine: England, Spain, and France. 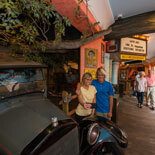 Guests can visit the Spanish sunken treasure room, a Timucan Indian Village and the Florida Cracker trading post. Watch in amazement as the friendly clerk, butcher and snake oil salesman demonstrate the very latest inventions for turn of the century living. Items such as a goat-powered washing machine and a gas powered iron! Its truly like walking into a Sears Roebuck catalog from 1908. The local actors/storytellers make this tour even more entertaining by providing history and humor all rolled into one. Over 100,000 items in this impressive collection. For people of all ages, this is a wonderful way to look back at the lives of our American ancestors. 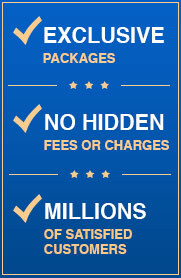 A fantastic package sure to please. Get your eTicket today and step back in time with the Fountain of Youth Package! Old Town Trolleys run daily. 9:00 am to 4:30 pm. Memorial Day weekend to Labor Day weekend. 9:00am to 5:30pm. July 4th tours close at 3:00pm. Trolleys board every 15-20 min and there are 23 stops along the route to sightsee, shop or dine. Closed Christmas day. Trolleys run half day on Thanksgiving and Christmas Eve. Fountain of Youth: Open daily from 9:00 a.m. to 5:00 p.m. Closed on Christmas day. Old Jail Daily tours from 9:00am to 5:00pm. Closed Christmas. Oldest Store Experience: Daily from 9:00 am to 5:00 pm. Closed Christmas Day. Children prices are 6-12 yrs. of age. Children 5 yrs. of age and younger ride free. Fountain of Youth is a walking attraction. Prices include all exhibits. 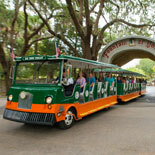 Old Town Trolley Tours of St. Augustine has been designated as a GEM by AAA's Florida Tour Book. A GEM is a "must see" point of interest that offers a great experience for members. 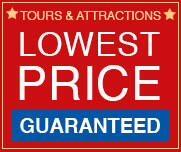 These attractions have been judged to be of exceptional interest and quality by AAA inspectors. Reservations are not required. When purchasing eTickets for groups of 20 or more, please call Customer Service so that we may most effectively serve your needs. Your printed eticket will contain all the details of this tour.